]1 Defender Max Kent ’20 moves the ball up the field in the men’s soccer team’s win against Hamline. After a tough loss against Luther this past weekend, the team prepares for a competive match against the Tommies on Friday. Photo by Rajnee Persaud ’19. Thirty-three games add up to over 49 hours of soccer. 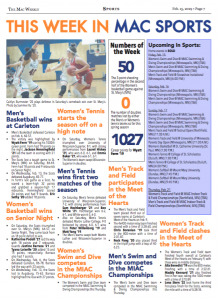 It’s also how long it had been since Macalester’s Men’s Soccer team lost a regular season game. And then they played Luther College. The Scots started out Sunday’s game in Iowa strong, but were unable to capitalize on any of their first half chances. Things looked hopeful for the Scots when Luther’s Myles Norville received a red card in the 59th minute, dropping his team down to 10 players. But, less than a minute later, the Norse scored what would be the game’s only goal, pouncing on a deflected clearance and the consequent scramble in the box. “I do think even though [the red card] helped us numerically, they seemed to get this extra jump of energy,” said Zeke Vainer ’17, goalkeeper and captain. Macalester was only able to muster two more shots throughout the half, finishing the game 0-1, which dropped their national ranking in a poll of DIII coaches from sixth to 15th. The result sent Luther rocketing from 17th into ninth. A number of players also cited team defense, as well as efforts to quickly move the ball up to the attackers, as something they need to adjust in the future. “What getting back to Mac soccer means is that we’re a playing team,” Olson said. “We want to be a team that possesses and plays and moves the ball.” On Friday night they’ll get a chance to do just that. 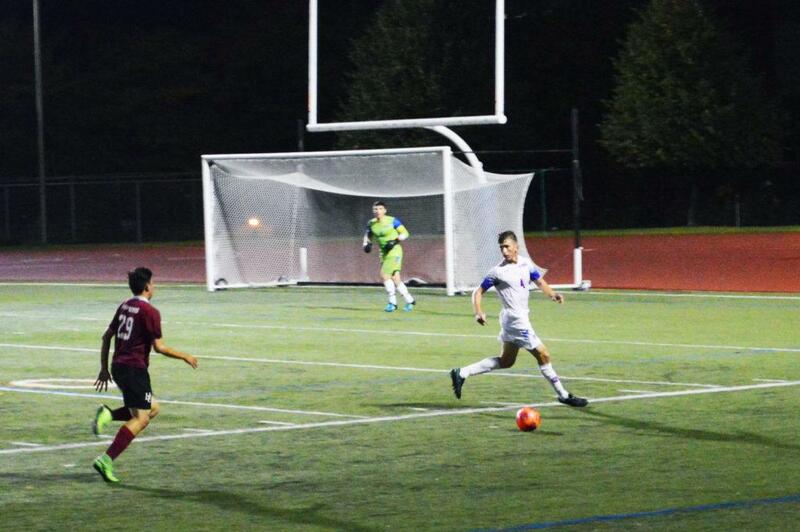 Macalester will be playing the University of Saint Thomas at 7:30 p.m. at Macalester Stadium. The Scots should be expecting a tough match, as the Tommies have won their past five games without letting in a single goal. St. Thomas has mostly gotten the better of the teams’ clashes since Olson took over at Macalester’s helm in 2012. They have won three of the last five games played, with Macalester overcoming the Tommies for the first time in the past four years during the 2015 regular season. St. Thomas won its last matchup though, defeating Macalester 2-1 in last year’s conference semifinals to kick the Scots out of the tournament. That adds extra meaning to Friday’s match. What adds even more meaning is the geographic rivalry between the teams. “The St. Thomas [game] has always meant something special,” said longtime fan and Macalester alumnus A. “Grimace” Virden ’96. “This is the type of game that alumni will come back for, in ways that they wouldn’t for just another MIAC game. I hope that it’s loud and crowded with students.” For their part, Macalester’s players and coaches say they’re ready to give their all. • Match their physicality. St. Thomas plays an athletic style of soccer. It is imperative that Macalester handle it well. • Watch the left side of the field. The Tommies have scored a number of their goals this year playing down the left wing. The Scots need to be wary of this tendency. • Get back to possession-based soccer. 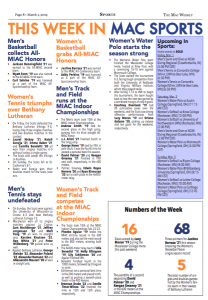 Macalester’s past few games have had moments of long passing at inopportune times. If they can return to their style of play, then they have a chance to emerge victorious.